Once in a while, you may have seen a light somewhat brighter than the brightest stars traversing the evening sky over the course of a few minutes. If so, you have almost certainly seen the International Space Station (ISS) as it travels some 400 kilometres above your head at a speed of 7.7km/s, completing an orbit once every 90 minutes. 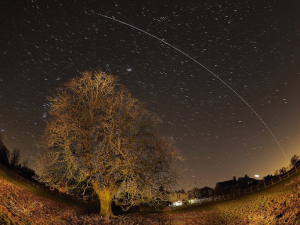 The ISS is visible because its altitude means that it reflects sunlight even when the Sun is below the horizon at your location, and it appears so bright because it is large. In fact, at its current size of 70m×110m×20m, it is the largest artificial body in orbit, forming a complex habitat that provides a home for up to 6 people for many months at a time, as well as offering a unique laboratory for a wide array of experiments ranging from psychology to physics. The station is an example of strong international cooperation, jointly owned and used by NASA, Roscosmos, ESA, CSA and JAXA (the space agencies of the USA, Russia, Europe, Canada and Japan). The first modules were launched in 1998, with a whole series of further modules added to build it to its current status, and the potential for further elements to be added in future.